Saved by my Stuart Weitzman 5050 boots yet again. Today was raining and I was struggling with what to wear. Anyone who knows me will know I profess to actually melt in the rain – no really, I will. I had to attend a conference, which would normally mean a suit, but the rain was throwing me a curveball. To be honest, it was really my cool new rain boots that were causing the problem. I purchased these awesome Chelsea styled black patent rain boots that I love and I wanted to wear them. Truthfully, I have been wanting to wear them everyday. More on those boots here! The issue with the rain boots is that none of my suits are tailored for flats – meaning no Chelsea rain boots with a suit. I tried two different pairs of cropped pants but wasn’t in love with either look. 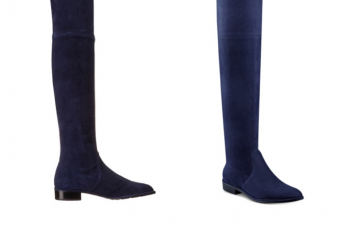 So finally, after a second look at the weather app confirming the rain wasn’t going to last all day I switched to my Stuart Weitzman 5050 Over-the-knee (OTK) boots as the wardrobe base. I added a tailored sheath dress, layered a turtleneck for warmth and tossed my bright red raincoat over everything. Done. 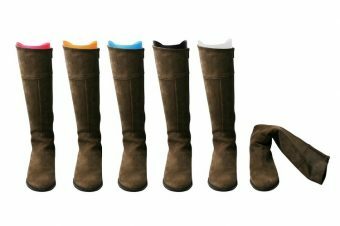 If you are looking for more budget friendly options for the Stuart Weitzman 5050 boots check out this post here.